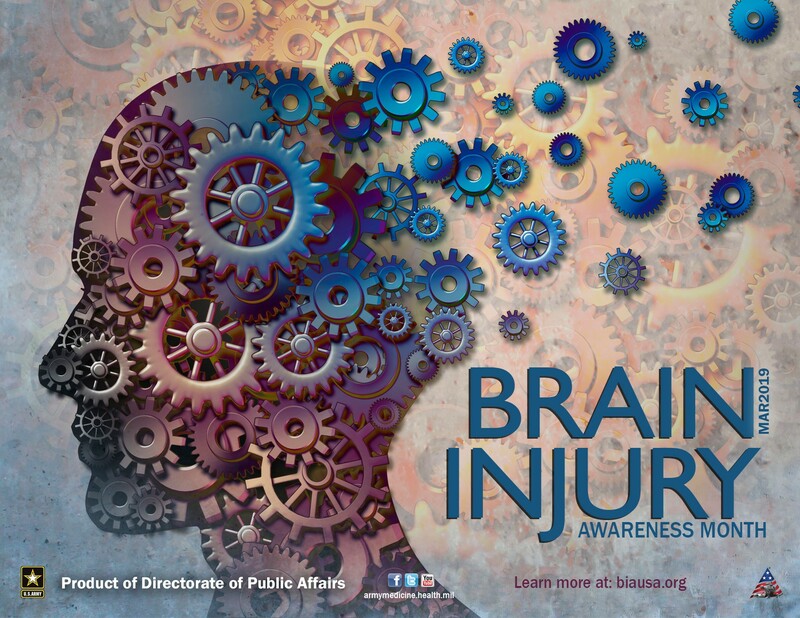 Did you know: March is brain injury awareness month? The month of March is dedicated to brain injury awareness and prevention, and the Landstuhl Regional Medical Center Traumatic Brain Injury Clinic is spreading awareness to help the local military community to know more about brain injuries, how to obtain educational material, and where to seek care. mTBI or concussion is referred to as the signature injury of the wars in Afghanistan and Iraq because many service members experienced blast or vehicle accidents that resulted in a concussive event during that time; however, brain injuries can happen to anybody. Here are some tips to help you prevent and recognize a concussion. Each year there are over 1.7 million TBIs reported, and data from 2016 indicates that seven percent of U.S. children have suffered a severe concussive event during their life time. The Defense and Veterans Brain Injury Center recorded a total of 383, 947 of U.S. service members diagnosed with TBI in the past 18 years. TBI cases continue to increase keeping them one of the most common causes of neurological disorders worldwide. 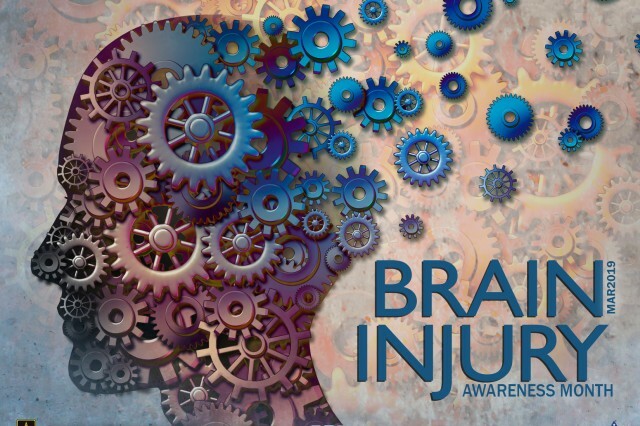 Did you know that mTBI can be caused by a multitude of types of accidents and injuries? Primary examples of TBI include slip and fall accidents, bicycle accidents, sports injuries, motor vehicle accidents or combative training. TBI occurs across a spectrum of severity from mild to severe and mTBI is a widespread injury among civilians and service members. Mild TBI is defined by the DVBIC as "a blow or jolt to the head that disrupts the normal function of the brain. It may knock you out briefly or for an extended period of time, or make you feel confused or "see stars" (alteration of consciousness)." It is important to keep in mind that not all blows to the head will cause a concussion, but sometimes that blow to the head can be more than a concussion as well. Did you know that mTBI is often referred to as a "silent epidemic"? Sometimes its symptoms are non-specific and commonly occur in the general population. Many patients fail to recognize and report and a brief loss of consciousness. Often, individuals with mTBI do not seek medical care at the time of injury, but they present to their primary care physician days, weeks, or even months after the injury with complaints of persistent symptoms. Furthermore, diagnosis of mild brain injury may be missed in the face of more dramatic physical injuries. Many patients may appear unimpaired and be discharged, only to notice the extent of their symptoms once they attempt to return to normal functioning. Did you know that going to the emergency room or seeing your primary care physician following a potential concussive event is important to receive the evaluation and the education needed to for a quick recovery? Seeking care following an injury event helps you to get the right education and care quickly to ensure full recovery and return to duty. Anyone who has had a concussive event is encouraged to contact their primary care provider or to self-refer to the TBI Clinic at LRMC should they have any questions about mTBI. The clinic's goal is to ensure that each member of the military community is evaluated appropriately and appreciates the necessary steps in recovering from a concussive event. The LRMC TBI Clinic, along with the primary care clinics throughout Europe, have TBI experts who can assist service members, veterans, and family members with mTBI screening, evaluation and treatment. Getting care for mTBI and understanding how to manage recovery is imperative. Ultimately the final goal is to ensure that each member of the military community is evaluated appropriately and knows the necessary steps in recovering from a concussive event. Rest is a vital part of treatment, but helping symptoms to resolve and gradually resume activities are key components for effective recovery. Your primary care physician or TBI clinic provider can assist you in understanding this and helping you get back to resuming your duties and activities. Did you know? You are not alone. We want our families and Service Members to recover quickly, sustain military readiness, and be able to maximize their quality of life. If you or a family member experience what you may think was a concussive event, seek care. Ask questions to your physician and follow your physician's guidance in slowly returning to normal activity to ensure that the symptoms don't recur. Think ahead toward prevention of accidents and use the appropriate protective gear to help protect your head. Helmets may not be "cool" but they are smart. You've only got one noggin, so please use it! For more information on the LRMC TBI Clinic, visit https://rhce.amedd.army.mil/landstuhl/Services/tbi.html.